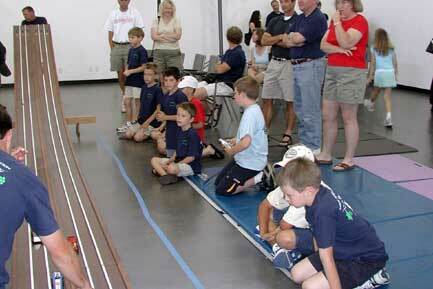 Construction of the Pinewood Derby is steeped in tradition. 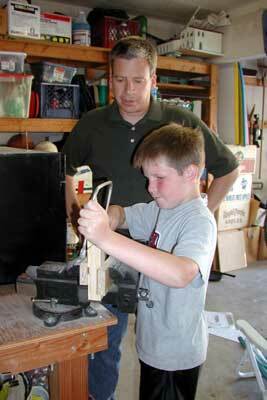 Keith remembers building Pinewood Derby cars with his father for Cub Scouts. This would be the third year they built a car together for Indian Guides. Neither Doug or Keith are adept craftsmen; this is their only woodcraft project of the year. Each year the goal is for Doug to do more of the work himself. This year was particularly difficult: due to the remodel and many other commitments, we didn't get around to starting the project until just a week before the race, a full one to two weeks later than we usually give ourselves. The first step is always the same: Doug picks out a Hot Wheel that will generally be our design. We then sketch it on the sides and cut it out from the block with the coping saw. Lessons are learning about the tool, sawing while not breaking the blade, and putting blocks in the vice to hold the wood. Doug must really like building the car to put up with so much lecturing. Everything was affected by the remodel. Not only did we get a late start, but we didn't have our usual working area. 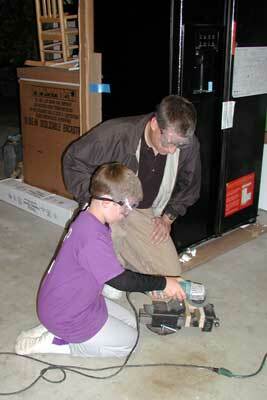 Note the microwave on our workbench, and the boxes and appliances in the garage in the pictures below. Using a power tool was new this year for Doug. Doug will appear often in his baseball shirt in the following pictures. Rather than think they were all taken in the same day, think instead that we crammed work in on the car wherever we could in our schedule, which was already full with baseball two evenings and on Saturday. The job of shaping the body with a file after sawing has always been laborious and tedious. Kristi suggested asking Craig our contractor if he had a better idea. Viola! Craig (who is always happy to help out) produces a rotary sander, the perfect tool for between sawing and hand sanding. Not only did Doug use this rotary sander, but we also used Keith's Dremel for grinding out a cockpit and a representation of a spoiler. 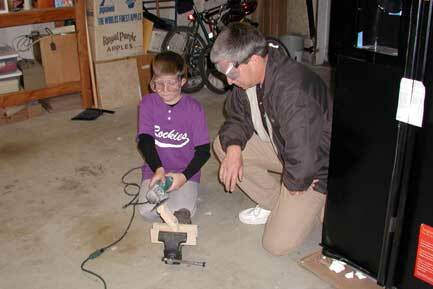 Keith bought the tool specifically for this task two years ago because he remembers using one with his father on his Pinewood Derby cars 30 years ago. It hasn't been used for much else. I love this picture. 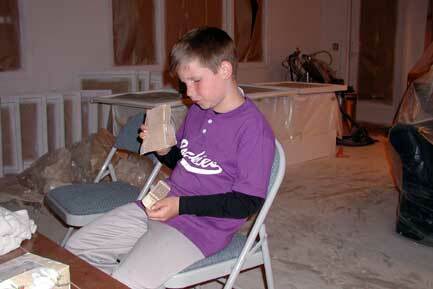 Sanding inside the house would of course never be considered under normal circumstances: too dusty and messy. But just look at the house! They're spray painting inside the house, everything is covered in plastic, and the floor is already covered in debris that is being tracked all over the house. So Doug, go do your sanding inside the house where it's warm! Here was the big advance in maturity this year: Doug did the spray painting. And I don't mean he got another year older and could now point a spray can. 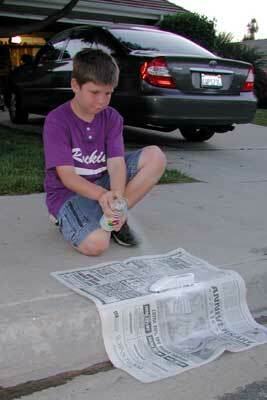 I mean that I got mature enough to let him apply the spray paint, get it on too thick, and run and drip. Because, it's his car,and he really enjoys the tactile job of spray painting it. The point here is the same point with the entire project: how is he (or any child) going to learn without trying it for themselves? See, I told you somebody got more mature. The last three steps in Pinewood Derby construction (decals, lead weights, and getting the wheels true) were unfortunately skipped, as we ran out of time before the race. Doug is in last year's light blue Indian Guide shirt, cleverly distinguishing himself in these pictures from everyone else wearing this year's dark blue shirt. Sort of indicative of the entire rushed, seat-of-the-pants nature of the project this year, Keith wasn't even able to attend the race. Our Indian Guide tribe drew a morning time slot on the Sunday the Nation held its races, and Keith had too many commitments (deaconing, Sunday School teaching, etc.) to skip church. Kristi took Doug, however, and took these pictures. 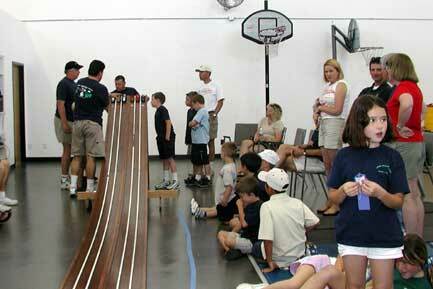 Without added weights, his car was too light and slow, and it was eliminated early. But Doug can be proud of how much of the car's construction he was responsible for.